Universal chuck key holder attaches your chuck key directly to your drill cord to help keep it where you need it. 30252 Fits most brands of 1/4", and 3/8" chuck keys; 30253 is universal. Black rubber. Works for any 3/8" Kreg drill bit. Designed for controlling the depth when drilling standard pocket holes with any Kreg Jig. Features a solid one-piece construction, magnetic tip, and complete quick-change compatibility. Deep #2 driver resists cam-out. Includes one of each: 3" and 6". Soft steel handle limits potential for dangerous fracturing under excessive loads. For a wide variety of indoor projects with limited exposure to the elements. Provides adequate rust protection. Washer-head provides a large amount of surface area on the head of the screw, helping to ensure the strongest possible hold. For a wide variety of indoor projects with limited exposure to the elements. Provides adequate rust protection. Sets below the surface of the wood when joining 1/2" stock. For a wide variety of indoor projects with limited exposure to the elements. Provides adequate rust protection. Washer-head provides a large amount of surface area on the head of the screw, helping to ensure the strongest possible hold. For a wide variety of indoor projects with limited exposure to the elements. Provides adequate rust protection. Sets below the surface of the wood when joining 1/2" stock. For a wide variety of indoor projects with limited exposure to the elements. Provides adequate rust protection. Washer-head provides a large amount of surface area on the head of the screw, helping to ensure the strongest possible hold. Soft steel handle limits potential for dangerous fracturing under excessive loads. For a wide variety of indoor projects with limited exposure to the elements. Provides adequate rust protection. Sets below the surface of the wood when joining 1/2" stock. Features three anti-corrosion layers, allowing them to be used for indoor and outdoor applications. Soft steel handle limits potential for dangerous fracturing under excessive loads. Soft steel handle limits potential for dangerous fracturing under excessive loads. For a wide variety of indoor projects with limited exposure to the elements. Provides adequate rust protection. Sets below the surface of the wood when joining 1/2" stock. For a wide variety of indoor projects with limited exposure to the elements. Provides adequate rust protection. Sets below the surface of the wood when joining 1/2" stock. For a wide variety of indoor projects with limited exposure to the elements. Provides adequate rust protection. Washer-head provides a large amount of surface area on the head of the screw, helping to ensure the strongest possible hold. Shock resistant tool steel has advanced hardening process. Soft steel handle limits potential for dangerous fracturing under excessive loads. Soft steel handle limits potential for dangerous fracturing under excessive loads. Use to hide or decoratively accent exposed pocket holes. Works with materials from 1/2" to 1-1/2" thick. Shock resistant tool steel has advanced hardening process. For a wide variety of indoor projects with limited exposure to the elements. Provides adequate rust protection. Washer-head provides a large amount of surface area on the head of the screw, helping to ensure the strongest possible hold. For a wide variety of indoor projects with limited exposure to the elements. Provides adequate rust protection. Washer-head provides a large amount of surface area on the head of the screw, helping to ensure the strongest possible hold. For use with the Kreg Jig HD and 1-1/2'' and larger stock. Large 2-1/2'' long #14 hardened-steel screws provide ideal shear resistance as well as a Protec-Kote finish with three anti-corrosion layers for long-term moisture resistance. Features three anti-corrosion layers, allowing them to be used for indoor and outdoor applications. Features three anti-corrosion layers, allowing them to be used for indoor and outdoor applications. For use with Makita drills, 601D, 6002D, 6010D, 6012HD, 6041DW, 6071D, 6073D Features three anti-corrosion layers, allowing them to be used for indoor and outdoor applications. Use to hide or decoratively accent exposed pocket holes. Works with materials from 1/2" to 1-1/2" thick. Use to hide or decoratively accent exposed pocket holes. Works with materials from 1/2" to 1-1/2" thick. Use to hide or decoratively accent exposed pocket holes. Works with materials from 1/2" to 1-1/2" thick. 6'' driver with deep #3 square drive. Optimized for use with Kreg Jig HD screws. Solid one-piece construction, magnetic tip, and complete quick-change compatibility for fast and easy bit changes. High-speed steel construction with ultra-sharp brad point tip. Drills smooth holes fast. For use with the 1/4" Kreg Shelf Pin Jig. For use with models DA3000 and DA3000R right angle drills, or 6000LR, 6510LVR, 6000R, DA3000R, HP1030. Coarse-thread for use with soft/plywoods. For indoor use. Zinc coated. Maxi-Loc screws have a large head that provides maximum bearing surface as the screw pulls tight in the pocket. A good choice for a wide variety of indoor projects with limited exposure to the elements. Zinc screws provide adequate rust protection. For indoor use. Fine-thread for use with hardwoods. Maxi-Loc screws are an ideal choice for a variety of applications. These screws have a large head that provides maximum bearing surface as the screw pulls tight in the pocket. The preferred choice for hardwoods that are hard and dense. These threads are less aggressive, so they'll drive without splitting, but these screws have a higher number of threads per inch to ensure great holding power. For use on Oak, Cherry, Maple, Poplar, Walnut, Birch, Ash, Hickory, and Mahogany. Includes (1) each: 1-1/4", 1-1/2", 2", 2-1/8" and mandrel. Made of hardened, high-carbon steel for strength and durability when working in applications such as covering fastener holes in furniture, cabinetry, floors, decks, or making dowels; 1/4" inch shank. Made of hardened, high-carbon steel for strength and durability when working in applications such as covering fastener holes in furniture, cabinetry, floors, decks, or making dowels; 1/4" inch shank. Made of hardened, high-carbon steel for strength and durability when working in applications such as covering fastener holes in furniture, cabinetry, floors, decks, or making dowels; 1/4" inch shank. Made of hardened, high-carbon steel for strength and durability when working in applications such as covering fastener holes in furniture, cabinetry, floors, decks, or making dowels; 1/4" inch shank. Coarse-thread for use with soft/plywoods. For indoor use. Zinc coated. Maxi-Loc screws have a large head that provides maximum bearing surface as the screw pulls tight in the pocket. A good choice for a wide variety of indoor projects with limited exposure to the elements. Zinc screws provide adequate rust protection. Allows accurate installation in wood doors by adjusting easy guide template arms to desired door thickness and backset sizes. For door sizes: 1-3/8" and 1-3/4". back set sizes: 2-3/8" and 2-3/4". For a wide variety of indoor projects with limited exposure to the elements. Provides adequate rust protection. Washer-head provides a large amount of surface area on the head of the screw, helping to ensure the strongest possible hold. Maxi-Loc screws are the Kreg Screw of choice for the majority of applications. These screws have a large head that provides maximum bearing surface as the screw pulls tight in the pocket. Blue-Kote-finished screws feature three anti-corrosion layers, making them the perfect choice for a wide variety of indoor and outdoor projects. Rust-resistant screws; works with pressure-treated material. Recommended for use with softwoods, as well as for sheet goods such as plywood and MDF that are soft and not very dense. The deep, aggressive threads bite into soft fibers to ensure solid holding power. High speed steel teeth for fast and clean cuts through wood. Tooth design allows for a more aggressive cut and holds more chips. Includes (1) one each: 1-1/4", 1-1/2", 2", and 2-1/8" saws and a mandrel. Features three anti-corrosion layers, allowing them to be used for indoor and outdoor applications. For a wide variety of indoor projects with limited exposure to the elements. Provides adequate rust protection. Sets below the surface of the wood when joining 1/2" stock. Carbon hole saws for wood doors, fits all interior and exterior doors, self centering jig fits all common door widths, adjustable for both 2-3/8" and 2-3/4" backsets. Includes: double sided jig, (2) carbon hole saws, 3/8" mandrel, bolt plate template, custom router bit, and hinge plate template. One-piece design that eliminates clogging and provides a smooth and fast drilling stroke. For Kreg jigs. 0.170" dia pilot tip. For a wide variety of indoor projects with limited exposure to the elements. Provides adequate rust protection. Washer-head provides a large amount of surface area on the head of the screw, helping to ensure the strongest possible hold. For a wide variety of indoor projects with limited exposure to the elements. Provides adequate rust protection. Sets below the surface of the wood when joining 1/2" stock. Features three anti-corrosion layers, allowing them to be used for indoor and outdoor applications. For a wide variety of indoor projects with limited exposure to the elements. Provides adequate rust protection. Washer-head provides a large amount of surface area on the head of the screw, helping to ensure the strongest possible hold. Provides protection for indirect maritime applications and other exceedingly corrosive environments. For use with the Kreg Jig HD and 1-1/2'' and larger stock. Large 2-1/2'' long #14 hardened-steel screws provide ideal shear resistance as well as a Protec-Kote finish with three anti-corrosion layers for long-term moisture resistance. For use on wood doors. Includes: positioning template for marking hole location, drill guide for accurate pilot holes 2-1/8", hole saw blade for fast cuts in hard woods, 1" spade bit for drilling edge bores, mandrel 3/32", Allen wrench, 1" wood chisel, 5/32" pilot drill centering template. For Kreg Joinery and use with any Kreg Jig. Features a 1/4" hex shank and compatibility with quick-change chuck. Can also be used with any manual Kreg Jig. Smoother cut from exclusive plate technology. Reduced cutting force: teeth are face ground/sharpened. Impact resistant. 18-degree hook angle. ATB tooth grind. 7000 RPM. Provides protection for indirect maritime applications and other exceedingly corrosive environments. For a wide variety of indoor projects with limited exposure to the elements. Provides adequate rust protection. Washer-head provides a large amount of surface area on the head of the screw, helping to ensure the strongest possible hold. For a wide variety of indoor projects with limited exposure to the elements. Provides adequate rust protection. Washer-head provides a large amount of surface area on the head of the screw, helping to ensure the strongest possible hold. Provides protection for indirect maritime applications and other exceedingly corrosive environments. For a wide variety of indoor projects with limited exposure to the elements. Provides adequate rust protection. Washer-head provides a large amount of surface area on the head of the screw, helping to ensure the strongest possible hold. For a wide variety of indoor projects with limited exposure to the elements. Provides adequate rust protection. Sets below the surface of the wood when joining 1/2" stock. The best value for an economy blade. Corrosion resistant coating helps prevent rusting. Precision ground teeth for smooth, accurate cuts; slots for straighter cuts. For use with Kreg Jig HD. Features a 1/4'' hex shank and compatibility with quick-change chuck and standard chucks. Drills a HD 1/2'' diam. pocket hole. One-piece, hardened steel, rugged design. Includes stop collar and allen wrench. For application where the smallest jig possible is required. Unlimited material thickness. Fenceless design allows you to make precise angle and stock depth adjustments. Hardened-steel drill guide. Glass-reinforced Nylon Body. Plug-setting guide helps to fully seat wood plugs. Works with a variety of common clamps or any Kreg Face Clamp. 1/2" to unlimited screw centering ability. Kit includes the Kreg Jig Mini, stepped drill bit, depth collar, and allen wrench. Engineered to optimize cutting for cordless saws, Steel carbide teeth. Ultra-thin kerf for fast cutting, Alternate face bevel tooth grind, .059" kerf, +3 degree hook angle. Allows accurate installation in wood or metal doors by adjusting easy guide template arms to desired door thickness and backset sizes. For door sizes: 1-3/8" and 1-3/4", back set sizes: 2-3/8" and 2-3/4". Smoother cut from exclusive plate technology. Reduced cutting force: teeth are face ground/sharpened. Impact resistant. 18-degree hook angle. ATB tooth grind. 7000 RPM. Bi-metal hole saws for metal and wood doors, fits all interior and exterior doors, self centering jig fits all common door widths, adjustable for both 2-3/8" and 2-3/4" backsets. Includes: double sided jig, (2) bi-metal hole saws, 3/8" mandrel, bolt plate template, custom router bit, hinge plate template. Carbide teeth with WeldTec construction are welded not brazed for stronger tooth bond, longer life and durability. Innovative heat vents and expansion slots help make straighter cuts. Reinforced shoulder provides durability for trim/finish applications. Ideal for fine finish work in remodeling, trim carpentry and general construction. Carbide tips stay sharper longer and resists damage from nails and staples. Fits most saw brands and models, including wormdrive. 60 triple sharp teeth for fast, clean cuts, an extra fine finish and long life in standard wormdrive saws. Extra high tooth count provides a superior finish in wood, plywood, finished plywood and other construction materials. Thin kerf with extra hard plate for less waste and increased accuracy. Speed Coat finish reduces friction and heat. 7,900 max rpm. Provides protection for indirect maritime applications and other exceedingly corrosive environments. Adjustable guides for accurate hole placement. Built-in measuring scales for repeatable results. Versatile for mounting single and multi-hole knobs. Strong and lightweight for easy handling. Adjustable edge guide for easy positioning. Durable hardened-steel drill guides. Install drawer slides the fast, easy way. For drawers that fit perfectly every time and slide smoothly. Accurate slide positioning with built-in indexing tabs. Repeatable results without measuring and marking. Versatile for use in cabinets, cases, and more. Reversible to mount slides to cabinet and drawer box. Secure for holding slides in place as you work. Strong, lightweight materials for easy handling. Optimized for DeWalt Cordless Miter Saw. Features ultra sharp carbide teeth, optimized hook angles and reduces tear out. Carbide teeth with WeldTec construction are welded not brazed for stronger tooth bond, longer life and durability. Innovative heat vents and expansion slots help make straighter cuts. Reinforced shoulder provides durability for trim/finish applications. Thin kerf, .083", saw blades for miter saws and table saws. Precision tensioned and balanced blade for an accurate cut; #400 grit diamond ground teeth for a smooth finish. Alternate top bevel, 15 degree hook angle. Smoother cut from exclusive plate technology. Reduced cutting force: teeth are face ground/sharpened. Impact resistant. 18-degree hook angle. ATB tooth grind. 7000 RPM. Includes 150 count of: SPS-F1 (1", fine), SPS-C1 (1", coarse), SML-F125 (1-1/4", fine), and SML-C125 (1-1/4", coarse), and 75 count of SML-C250B (2-1/2", coarse). Provides everything needed to switch from drilling pocket holes to driving pocket screws. Includes quick-change chuck, a 6" #2 square driver, 3/8" hex-shank pocket-hole drill, allen wrench, and depth collar. Make cabinet door installation easy. Get drill press accuracy with any hand drill. Accurate hinge positioning with built-in indexing tabs. Repeatable results with built-in measuring scales. Reliable drilling with bit guide and stop collar. Simple to use with any drill; no special tool needed. Adjustable cams ensure proper hinge offset. Durable carbide tipped drill bit included. Strong, lightweight materials for easy handling. Carbide teeth with WeldTec construction are welded not brazed for stronger tooth bond, longer life and durability. Innovative heat vents and expansion slots help make straighter cuts. Reinforced shoulder provides durability for trim/finish applications. Coarse-thread for use with soft/plywoods. For indoor use. Zinc coated. Maxi-Loc screws have a large head that provides maximum bearing surface as the screw pulls tight in the pocket. A good choice for a wide variety of indoor projects with limited exposure to the elements. Zinc screws provide adequate rust protection. For indoor use. Fine-thread for use with hardwoods. Maxi-Loc screws are an ideal choice for a variety of applications. These screws have a large head that provides maximum bearing surface as the screw pulls tight in the pocket. The preferred choice for hardwoods that are hard and dense. These threads are less aggressive, so they'll drive without splitting, but these screws have a higher number of threads per inch to ensure great holding power. For use on Oak, Cherry, Maple, Poplar, Walnut, Birch, Ash, Hickory, and Mahogany. Allows accurate installation in wood or metal doors with the two most common sizes for accurate installation. Attached pass through shank arbor, variable pitch positive rake teeth reduce vibration and clear chips, M3 cutting edge is longer lasting and teeth are shock resistant. Includes (1) each: 1", 2-1/8" high speed steel hole saws and 4-5/16" pilot drill. Compact injection molded hole saw kit box with carrying handle. Three trade specific configurations contain the most commonly used sizes. Utilizes C-clamp design with tool free clamping and no surface damage, compatibility for the two most common backsets and door thicknesses. Includes: 1", 2-1/8", mandrel, adapter, drill guide, replacement parts (including two additional pilot point centering bits), two adjustable bushings which accept both standard backsets and both common door thicknesses, and new quick change mandrels (DW1803 and DW1810) for increased user productivity. Engineered to maximize runtime. Body slot design for smooth cuts. Submicron grade carbide teeth for long life. Thin kerf design for smooth, efficient cuts. Coarse-thread for use with soft/plywoods. For indoor use. Zinc coated. Maxi-Loc screws have a large head that provides maximum bearing surface as the screw pulls tight in the pocket. A good choice for a wide variety of indoor projects with limited exposure to the elements. Zinc screws provide adequate rust protection. Designed for melt free cuts. Laser cut plate for true, straight cuts. Patented body slot design for smooth cuts. Power brushless motor provides 5200 rpm maintaining speed under load. 7-1/4" capacity blade provides 2-9/16" cutting capacity at 90 degrees. Applicable materials: iron, steel, aluminum, brass, copper and wood. 40 Carbide teeth. Non-stick coated finish. Diamond Arbor Knockout. Six hardened-steel drill guides. Removable, dual-position fence. Standard 32mm hole spacing. Includes 5mm drill bit. Included locating pin for fast, accurate registration. Built-in storage for locating pin, drill bit and depth collar. Jig allows you to create three popular types of pocket hole joints with accuracy and relative ease. Made of heavy duty aluminum, it can be mounted to a bench for stationary use and includes a clamping system for portable use. Used in applications such as building cabinets, furniture or other high precision woodworking endeavors. Includes: 1 pocket hole jig with clamps, 3/8" step drill bit; 3 step drill stops: 1/4", 5/16", 3/8", hex wrench, 6" steel square drive bit, square drive screws. The ideal way to store and organize an entire Kreg Joinery system in one compact, convenient case. The case holds your Kreg Jig, plus accessories like clamps, bits, drill guide blocks, screws, and more. Custom inserts organize and protect contents, making it easier than ever to keep everything needed close at hand. Features two independent positioning sliders, nine individual depth settings, two wood chip relief holes, and hardened-steel drill guides. 7/8" drill guide spacing. Works with with a wide variety of clamps. Face Clamp for clamp pad adapter. 1/2", 5/8", 3/4", 7/8", 1", 1-1/8", 1-1/4", 1-3/8" and 1-1/2" screw centering ability. Kit contains Kreg Jig Jr., clamp adapter, stepped drill bit, 6" driver bit, depth collar, allen wrench, starter screw set, instruction manual, and carrying case. Cuts through ferrous metals quickly and accurately leaving clean, burr free cuts; features teeth with Triple Chip Grind (TCG) and a special carbide blend with outstanding resistance to the high impact generated by steel cutting. Bi-metal construction and hard steel RC 65-66 for long life; 4/6 variable pitch teeth for reduced noise and improved performance with clearly printed hole saw sizes for quick retrieval. Includes (1) one each: 3/4", 7/8", 1-1/8", 1-1/2", 1-3/4", 2-1/4", (1) each: 1/2" hex shank, 3/8" hex shank, pilot drill and carrying case. Drills clean wood, nail-embedded wood, plastic, aluminum, metal, cast iron and stainless steel. The Diablo 9 piece hole saw kit features (5) bi-metal hole saw cups, (1) piece SnapLock Plus mandrel, (1) pilot bit and (2) adaptor nuts (1/2" and 5/8") for quick and easy hole saw cup changes for maximum job performance. This new, high performance hole saw set delivers faster cutting performance and increased productivity versus standard bi-metal hole saws. Diablo's hole saws and ShapLock Plus mandrel system simplify the attachment process for fast and efficient hole saw mounting. 60 mm (2-3/8") cutting depth for 40 percent deeper holes in 1 pass and increased productivity. 1-size fits all mandrel, fits all Diablo hole saws from 5/8" to 6" diameter. Tool free plug ejection for fast material removal. Variable tooth design provides faster cuts with less vibration. Sizes included: 7/8", 1", 1-1/8", 1-3/8", 1-1/2" and 2". Also includes Mandrel, Pilot bit, 2 Adaptor Nuts and a heavy duty durable case for easy and convenient storage of hole saws. Ice Hardened cryogenically treated for longer life. Optimized tooth form for faster cutting. Wide, angled and offset slots for easy plug access. Bi-metal construction with 8 percent cobalt for increased wear resistance. Kit includes: (1) 1-1-2" Ice hardened bi-metal hole saw, (1) 1-1-8" Ice hardened bi-metal hole saw, (1) 1" Ice hardened bi-metal hole saw, (1) 1/8" hex key, (1) 3/4" Ice hardened bi-metal hole saw, (1) 7/8" Ice hardened bi-metal hole saw, (1) Hole saw adapter, (1) 1/4" x 3-1/2" high speed steel pilot bit. Also includes convenient case for organization and transport. Optimized for large outdoor projects. For use with 1-1/2'' materials and up. Works with the K3 and K4 Kreg Jig and Kreg Jig Master System. Stop block provides easy, repeatable registration to workpiece. Face clamp locks into Kreg Jig HD for secure drilling. Hex shank HD drill bit is quick-change compatible. For use when framing walls, building deck railings, backyard furniture, fences, benches or other large projects. #14 industrial-quality, heavy-duty, hardened-steel screws which provide resistance as well as a three anti-corrosion layers for long-term moisture resistance. 6'' HD driver bit. Works as a stand-alone jig, simply connect to your Kreg Face Clamp. Heavy gauge laser cut hardened and tempered steel plate is precision balanced for accurate cuts. Laser cut expansion slots minimize noise and edge vibration for excellent surface finish with less burrs. Extra hard carbide ensures that cutting edges stay sharp. Blade is laser etched and color coded by material. User can see important information when they need to replace blade. Applicable materials: Aluminum, Ferrous and Non-Ferrous metal. 5/8" dia. arbor size. Carbide tipped cutting edge material. Kerf: 0.082" W. Maximum speed: 4000 rpm. Triple chip grind teeth. 2-3/8" cutting depth. Ice Hardened cryogenically treated for longer life. Optimized tooth form for faster cutting. Wide, angled and offset slots for easy plug access. Bi-metal construction with 8 percent cobalt for increased wear resistance. Kit includes: (9) hole saws; 3/4", 7/8", 1-1/8", 1-3/8", 1-1/2", 1-3/4", 2", 2-1/8" and 2-1/2", (2)arbors; 49-56-7010, 49-56-7250, (2) pilot bits; 49-56-8010 (assembled with arbors). Also includes convenient case for organization and transport. Engineered to maximize runtime. Thin kerf design for high efficiency. Carbide teeth for long life. Self-feed pilot bit for fast, efficient cutting. Spring loaded collar automatically engages drive pins to prevent hole saws from locking to the mandrel. Kit includes: (3) hole saws - 2-1/8", 2-9/16" and 3-5/8", (1) Quick change Mandrel and (3) Self-feed Pilot bits. Includes hole saws: 7/8", 1-1/8", 1-3/8", 1-1/2", and 2", Snap-Back 2L and 5L and carrying case. Aggressive tooth geometry, deep gullets for easy plug removal. Three hardened steel teeth provide maximum durability against unintended nail impacts; cuts up to 600 holes in wood without needing to be re-sharpened. Includes: (3) hole cutters: 2-1/8", 2-9/16", 3-5/8", (1) arbor with pilot bit, (2) pilot bits, (1) diamond file, (1) hex wrench and impact resistant case with storage space for additional hole cutters. High speed steel teeth are reinforced to cut stronger, last longer, resists tooth strippage and withstands high torque. Includes (1) one each: 3/4", 7/8", 1-1/8", 1-3/8", 2", 2-1/2", arbors: 2L, 5L, 1) pilot drill (1) arbor adapter and carrying case. Provides protection for indirect maritime applications and other exceedingly corrosive environments. SnapLock plus mandrel system for quick and easy change with no down time. First carbide hole saws that allow operators to cut wood, nail embedded wood and metal using the same hole saw cup. 10 times faster cutting in hard materials. Tool free plug ejection for fast material removal. Variable tooth design delivers faster and easier drilling with less operator effort. 2-3/8" cutting depth for 40 percent deeper holes in 1 pass and increased productivity. For drilling wood, plastic, aluminum, metal and stainless steel. Carbide tipped. Set includes: (1) 1", (1) 1-1/8", (1) 1-3/8", (1) 1-1/2", (1) 2", (1) Mandrel, (1) Pilot bit and (2) Adapter Nuts - 1/2" and 5/8" thread. Removable drill guide for benchtop and mobile use. 1/8" incremental settings for materials from 1/2" to 1-1/2" thick. Three drill guide fixed spacing on hardened steel drill guide. Toggle clamp on benchtop base. Face clamp for portable base. 1/2", 5/8", 3/4", 7/8", 1", 1-1/8", 1-1/4", 1-3/8", 1-1/2" screw centering ability. 9/16", 7/8", 1-7/16" drill guide spacings. Includes jig, spacer block, stepped drill bit, 6" square driver, starter screw set, starter plug set, Skillbuilder DVD, and quick-start guide. Drills clean wood, nail-embedded wood, plastic, aluminum, metal, cast iron and stainless steel. 60 mm (2-3/8") cutting depth for 40 percent deeper holes in 1 pass and increased productivity. Delivers faster cutting performance and increased productivity versus standard bi-metal hole saws. This set includes a heavy duty durable case for easy and convenient storage of hole saws. 1 size fits all mandrel and Diablo saws from 5/8" to 6" diameter. Tool free plug ejection for fast material removal. Variable tooth design provides faster cuts with less vibration. Includes: (10 cups) size: 7/8" 1", 1-1/8", 1-3/8", 1-1/2", 1-3/4", 2", 2-1/8", 2-1/2" and 2-9/16". Also includes Mandrel, Pilot bit and (2) Adaptor nuts. High speed steel teeth are reinforced to cut stronger, last longer, resists tooth strippage and withstands high torque. Includes: (1) one each: 7/8",1", 1-1/4", 1-3/8", 1-1/2", 1-3/4" 2-1/8", (2) arbors 5L, 6L, (1) pilot drill and carrying case. Thin kerf, .106" , saw blade for circular. Designed for smooth ripping and crosscutting in wood, all building materials, plywood, chipboard, paneling, pressboard and marlite. Provides smooth finish used for woodworking and construction. Alternate top bevel, .060" plate, 14 degree hook angle. All new clamping mechanism that has a front-mounted handle and adjusts to different work piece thicknesses without tools or adjusting nuts. Large support wings with built-in storage compartments, standard swiveling dust collection port, quick-release adjustment of the removable drill guide block and full compatibility with the Kreg Micro Pocket Drill Guide and Kreg Jig HD. Matrix II Bi-metal teeth, ice hardened for longer life, positive rake angle for fast cutting, radius tooth back reduces stress on teeth, deeper gullets for fast chip removal and functional slot geometry provides easy plug removal. Includes: 1", 2", 2-1/8", and 2-1/2" Bi-Metal Hole Saws; 7/8", 3/4", 1-3/8", 1-1/2", 1-1/8", 2-1/4", and 1-3/4 Hole Dozer Bi-Metal Hole Saws; 3/8" Hex Shank Arbor, (2) 3-1/2" Pilot Bits, 1/8" Hex Key, and 7/16" No Wobble Arbor. Features a durable glass-reinforced nylon body, a solid clamp design, and a large clamping recess for securing to work surface. Removable drill guide for use with benchtop and portable bases. Toggle clamp on benchtop base. Face clamp for portable base. 1/2", 5/8", 3/4", 7/8", 1", 1-1/8", 1-1/4", 1-3/8", 1-1/2" screw centering ability. Three hardened-steel drill guide fixed spacing, 9/16", 7/8", 1-7/16". Dust collection shroud. Material support stop. 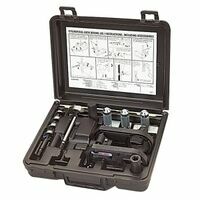 Includes jig, face clamp, portable base, drill guide spacer, material support stop, dust collection attachment, spacer block, 3/8" stepped quick-change drill bit, 6" and 3" quick-change square driver, starter screw set, starter plug set, quick-start guide, SkillBuilder DVD, and carrying case. The Universal Quick Change system allows you to use one mandrel for all sizes of hole saws with the help of two different sized nut adapters that fit most standard hole saws without the need of any additional tools. Progressive tooth design offers a powerful bite and an accelerated chip clearance. Plug removal is easy with a simple angled reinsertion of the pilot bit. Specs: arbor size 3/8", pilot bit diameter 1/4", pilot bit length 3-3/8". Includes: 7/8", 1", 1-3/8", 1-1/2", 1-3/4", 1-1/8", 2", 3", 2-1/8", 3/4", 2-1/2", (4) 9/16" to 1-3/16" adapter nuts, (7) 1-1/4" to 6" adapter nuts, (1) 3/8" mandrel, (2) 3-3/8" x 1/4" pilot bits, carrying case. Combines the popular Kreg Jig K5 with premium accessories, allowing a new option when using the Kreg Joinery system. The Master System adds a 3" Automaxx auto-adjusting face clamp, as well as a portable base to the Kreg Jig K5. Adding the portable base gives buyers yet another use for this handy jig; simplified setup for portable building and making repairs. Plus, the Kreg Jig K5 Master System includes downloadable plans to help get you started building projects as soon as you take this system home. Thin kerf, .106" , saw blade for circular saws. For woodworking & construction, produces high quality precision and smooth cuts in all woods. Alternate top bevel, .060" plate, 15 degree hook angle. 40 triple sharp teeth for a fine finish, fast, clean cuts and long life in standard or wormdrive saws. High tooth count provides excellent finish in wood, plywood and other construction materials. Carbide tip stays sharper longer and resists damage from nails and staples. Fits most brands and models, including wormdrive. Ideal for finish work in remodeling and general construction. Thin kerf with extra-hard plate for less waste and increased accuracy. Speed Coat finish reduces friction and heat. Thin laser cut kerf provides faster, cleaner cuts. Perma-Shield coating shields blade against heat, gumming, and corrosion. Micrograin titanium carbide tipped teeth are impact-resistant to hold their edge longer. Laser cut stabilizer vents trap noise and vibration and stabilize blade. Laser cut heat expansion slots reduce heat and blade warp. Tri-metal shock-resistant brazing for stronger carbide teeth. Porter Cable Cylindrical Lock Boring Jig, Suitable For Use With: Cylindrical Door Locks of Door Thickness Between 1-5/16 and 2-1/8 in, Metal, Silver, Includes: Lock Boring Jig, 1 in Boring Bit, 2-1/8 in Boring Bit, Full-Up Strike Mortiser, Latch Mortiser, Maximum Security Mortiser, Strike Locator, (1) Quick Change Drill Adapter and Storage Case Smoother cut from exclusive plate technology. Reduced cutting force: teeth are face ground/sharpened. Impact resistant. 18-degree hook angle. ATB tooth grind. 7000 RPM. For corded circular saws. 5/8'' universal diamond arbor. .071'' thin kerf for faster, cleaner cuts. Heat vent/expansion slot design reduces vibration for longer life and straighter cuts. Precision honed C3 tungsten carbide tips hold edge longer. Round shape means each tooth cuts uniform equal amounts of wood. Blade flatness ensures close tolerances. Alternate top bevel grind-20 degree hook angle. Fully hardened plate runs truer longer. Reinforced shoulder for added durability. Drills clean, accurate holes in all entry door materials. Features large handle and tool free backset adjustment, lightweight die cast aluminum construction for durability, and easily converts from 2-3/8" to 2-3/4". Includes: spade bit, multi-spur bit, replaceable mortise blades, 1-1/2" adaptor ring, strike locator tool, jig, and tool box. Whether you are a professional contractor or a weekend do-it-yourselfer, you will immediately appreciate the great features the Kreg DB210 Foreman Electric Pocket-Hole Machine has to offer. With one pull of the handle, the motor starts, the work piece is clamped, and the machine drills perfect pocket holes. The adjustable fence positions the work piece for precise pocket depth, and a pair of adjustable stops provides repeatable accuracy. A powerful motor enables fast drilling, and a quick-change chuck allows for fast bit changes. Plus, the new Foreman is the first Kreg pocket-hole machine that can create all three types of Kreg joints: standard 3/8", Micro Pocket, and 1/2" HD. The Foreman comes with a 3/8" step-drill bit and hardened guide, while the accessory Micro Pocket and HD bits and guides are sold separately. Triple your work output or simply get it done faster with the Kreg Foreman. Powerful 110 volt, 5.0 amp, 2,800 rpm motor for fast drilling. 14" x 23-1/2" cast aluminum tabletop provides ample work space. Adjustable fence and depth stop for precise pocket depth in 1/2" to 1-1/2" material. Dust collection port on the base connected internally to catch chips at the source.